Next Meeting: Friday Aug 26th. Measure how air pollution changes over time and space. Identify areas of San Ysidro that are highly affected. The information collected will be used to identify the sources and levels of air pollution with the goal of developing mitigation strategies that might reduce exposure in the community. Regular meetings between the project group and the community will ensure that community concerns are well understood and being addressed. This will be a 2-year project, and funding is provided by the State of California Office of Environmental Health Hazard Assessment. 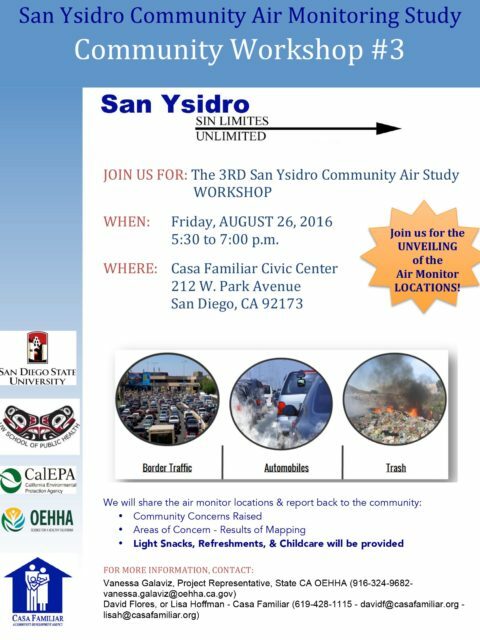 San Ysidro Air Study_Timeline.CSCUpdated082016 copy – download Air Study Timeline. Community Partners, including Casa Familiar, will inform the main goals and objectives of this study. In addition, the community will collaborate with scientists in selecting the location of the 12 monitoring sites. 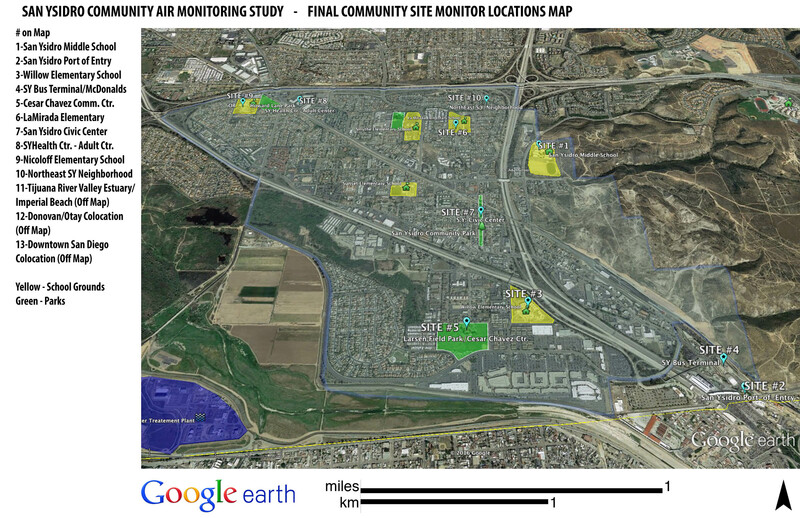 Community partners will be key in disseminating results of the study, identifying mitigation strategies and leading future efforts to reduce air pollution impact in the San Ysidro area. Scientists from the University of Washington and San Diego State University will provide both equipment and technical guidance to maximize the quality of data collected. Type of pollutants measured, location of the monitors and analysis methods will be selected to best address the concerns raised by community partners. The scientists will oversee data collection and analysis. Project results will be shared with community partners on an ongoing basis through meetings and a dedicated website. We expect that our results will increase the community understanding of the geographic differences in the community with traffic pollutants, origins of pollutants and potential hazards to the community. Additionally, we hope to increase community knowledge and empowerment and provide guidance on future solutions. ALL SAN YSIDRO RESIDENTS and interested persons are invited to participate in a new research project aimed at investigating the distribution of outdoor air pollution in the community. NEXT MEETING IS ON TUESDAY, MARCH 23RD 2016 AT 5:30 PM.